The difference between building one of the three fastest cars on the track and bringing home the hardware -- or leaving with a certificate of participation -- is the lessons each child (and far too often their parents) have learned the year before, applied to their car and brought back to the race. Many of the lessons my son and I learned this weekend while shaping, sanding and painting a 7-inch block of wood into a lightning-fast, first-place performance also apply to the growth of a venture-backed tech company, from seed and early stage to growth, scale and exit. Inside every block of wood lies the potential for a first-place performance. But not all racecars or technology startups are created equal. Unfortunately, most companies don't take the time to figure out what shape to take or how best to refine the position of their products against the competition. Instead of crafting a sleek, smooth message that overcomes wind resistance, reduces drag and resonates with customers, many companies grind it out with tired sales pitches, grainy product presentations and bland branding that is more than a little rough around the edges. It's like pounding the wheels into the rectangular wooden block that comes in the box and racing against a diagonal wedge: pencil-thin in front, tapered fat in the back, shaped for speed and built to win. You might cross the finish line eventually, but high-growth, aerodynamic marketing increases your probability of success. When it comes to improving the performance of your company, the challenge is sometimes not in what you add, but in what you take away. It takes a concentrated amount of focus, commitment and effort to whittle down your value proposition into racing shape, sanding away the excess until it's smooth to the touch, essential, relevant and unique to your customers. The companies that have identified barriers to product adoption and reduced as much friction as possible from the sales cycle consistently win the race over their competitors. So polish your lead flow management processes until the axels shine, streamline your lead nurture programs until the wheels spin freely with graphite and craft content that helps your buyers easily get the information they need to make a purchase. Then scale and repeat as you grow. Never underestimate the power of a shiny new coat of paint. It can improve the appearance of your company, generate customer attention and make your company look bigger and more credible to prospects during a decision making process. But a pretty paint job can't cover up a poor product. And while an “award-winning” website or “mind-blowing” digital campaign might generate a lot of visitors and make marketing feel all warm and fuzzy inside, those dollars are wasted if the initiative doesn’t convert traffic and generate qualified leads for sales. It's like spending time and money designing the nicest-looking car on the track to win a creative consolation prize, when you should have been fielding the fastest car to the finish line. It’s fine for Cub Scouts, but not for an entrepreneur with venture capital on the line. You’ve got to know what game you're playing and what it takes to win. Good things come to those who “weight.” Knowing where to weight your car is one of the biggest deciding factors in winning the race. The fastest cars place the majority of the weight in the back to push the car down the slope and maintain its speed through the flat part of the track. But too many tech companies don't know where to put their marketing dollars. They spread their budgets too thin or concentrate too much of their limited time, money and resources in the wrong places. Instead of building a strong, stable and strategic foundation that serves as a force multiplier to make all of their sales and marketing activities more effective, they dilute their efforts with short-sighted tactics. Understanding how to adjust the “center of gravity” allows companies to achieve exponential gains, instead of just incremental, creating the possibility of 2+2 equaling something far greater than 4. It doesn’t matter how nice your racecar looks at the top of the track, if the wheels start wobbling when the starting pin drops and gravity sets the car in motion. Successful entrepreneurs need to check the alignment, pivot the axles and make ongoing adjustments based on feedback from customers, the level of competition and industry racing conditions. Too often, sales and marketing are not in alignment, pulling the car in different directions. Sometimes the management team and board of directors continuously bump against the center rail as the car is rolling down the track. The difference between winning and losing the startup race often comes down to limiting internal resistance, keeping the wheels spinning forward and straight and aligning your product with the needs of your customers in order to meet your revenue projections and cross the finish line in the shortest time possible. 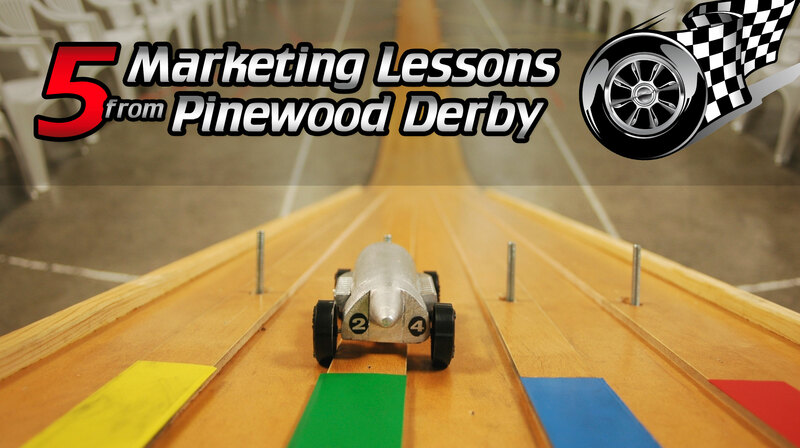 The fastest Pinewood Derby racers know that the way to the winner's podium is to maximize the momentum of the car and reduce the amount of friction between the wheels and the track. The toughest but most rewarding lessons in the startup race begin with the finish line in mind. Every tech company starts as a little block of wood, a promising idea in need of continuous refinement. From targeting the right customers and achieving product market fit to driving consecutive quarters of growth and achieving a successful exit, the journey is long and all who begin the race do not always finish. Despite what young Cub Scouts – and some entrepreneurs – might believe, the coolest-looking cars aren't always the fastest. The best products don't always win and if you build it, the customers might not always come. Sometimes their cars run out of gas before crossing the finish line. But we continue racing and learning nonetheless. As for my son and I, it's been very gratifying to learn some of these lessons together, after spending many hours in a freezing cold garage teaching him how to (safely) play with power tools, sandpaper and spray paint. I'm happy to have a fun father-son project to look forward to working on with him each year and proud to watch him take home his first ever first place trophy, much as I’m proud to work alongside hard-working entrepreneurs when their companies succeed. And despite the ups and downs the track might take, no one can take those experiences away from us. All the best in your 2015 revenue race. G. Scott Shaw is the President and Founder of Everclear Marketing, the B2B marketing agency for venture-backed tech companies. He is a results-driven marketing executive with 15 years of experience re-positioning venture-backed technology companies, developing breakthrough brand strategies and consistently executing high-growth sales and marketing programs for entrepreneurs, investors and their portfolio companies.